He has just recently concluded his "Demon Cycle" with a breathtaking finale and he's in Berlin again! Dark fantasy fans, Otherlanders, don't miss the opportunity to listen to Peter V. Brett reading from his latest book, The Core, and take all your Demon Cycle books out of your library one last time to get signatures. The April 30th discussion focuses on Peter Brett's The Warded Man. Peter V. Brett's book The Skull Throne was available from LibraryThing Early Reviewers. Peter V. Brett's book The Warded Man was available from LibraryThing Early Reviewers. 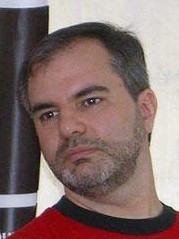 Peter V. Brett is currently considered a "single author." If one or more works are by a distinct, homonymous authors, go ahead and split the author. Peter V. Brett is composed of 7 names. You can examine and separate out names.